Paul and I first met working as designers in a digital agency about 15 years ago. We both shared a love of nature and the outdoors and soon became friends, going on camping and walking trips in the UK. One year, we decided to buy a mutual friend a beekeeping lesson for his birthday, and it changed our lives forever. We ended up enjoying the course even more than our mate, and decided to go to a couple more sessions. That was it for a while until in 2010 I decided to take the plunge and quit my job in London to go travelling. I made my way to New Zealand and, as luck would have it, got a job on a bee farm for a season. My role was to install and inspect hives all across the city of Auckland. I returned to London in 2012 with idyllic stories of bees, honey and fresh air. It didn’t take long to rope in Paul, and we decided to buy our own bees and start a beehive rental company in London. However, it soon dawned on us that the honey we were making and selling as a by-product was more popular than the beehive rentals, and so we conceived Black Bee Honey. During the off season of 2016/17 we spent 6 months developing our brand and strategy in preparation to launch the company. Just over half way through our month long crowdfunding campaign we successfully raised over 150% of our target - to our great relief! 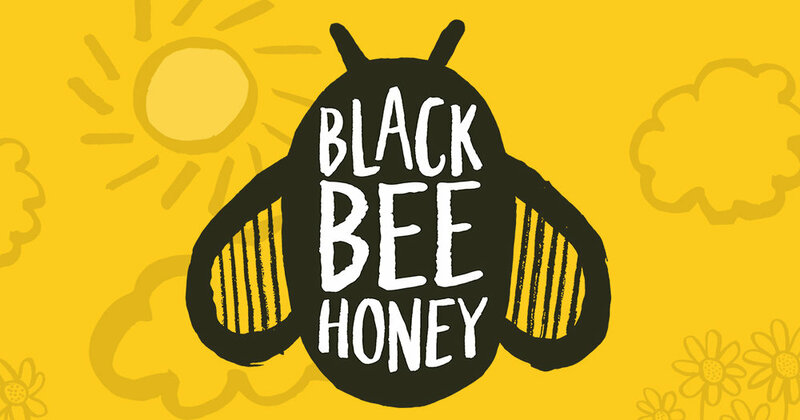 The name Black Bee comes from the original British honey bee which almost died out a century ago but is now having a resurgence. It’s also a fitting emblem for our desire to support British bees and their keepers. In the UK we only produce about 10% of the honey we consume, most of it being a blend of EU and non EU honey. We currently work with local beekeepers based in London, the Cotswolds and Exmoor to create 3 products, all jarred in batches straight from the hive: London Honey, Summer Honey and British Heather Honey. Crucially, the honey is left unprocessed to ensure that each jar retains its optimum flavour and nutritional benefits - just as the bees intended. Raw honey, as it's known, is a completely different beast to your average jar of supermarket honey and being single-source too, means that the flavour of each jar is unique, unlike blended honey. The London variety is sourced from our very own hives with the huge variety of plants and trees in the cities parks and gardens giving it a mind blowing complexity. The Summer variety is also multifloral created from a wonderful mix of wildflowers - a taste of summer in a jar. And the Heather is a monofloral variety know by some as the British manuka. All 3 have distinctly different flavours, textures and colours but share the same lack of processing. Being a beekeeper and honey producer is a completely different job than being a designer with a lot of work happening outdoors. It can also be very unpredictable, as you never completely know what the weather will be doing or how the bees are going to behave. But that just keeps us on our toes. We still get to do a bit of design by working on the branding for our own jars and website, but our roles are much more varied now, also taking up finance, marketing, sales and logistics of our company. We are learning a lot on the job, and there’s never a dull moment.